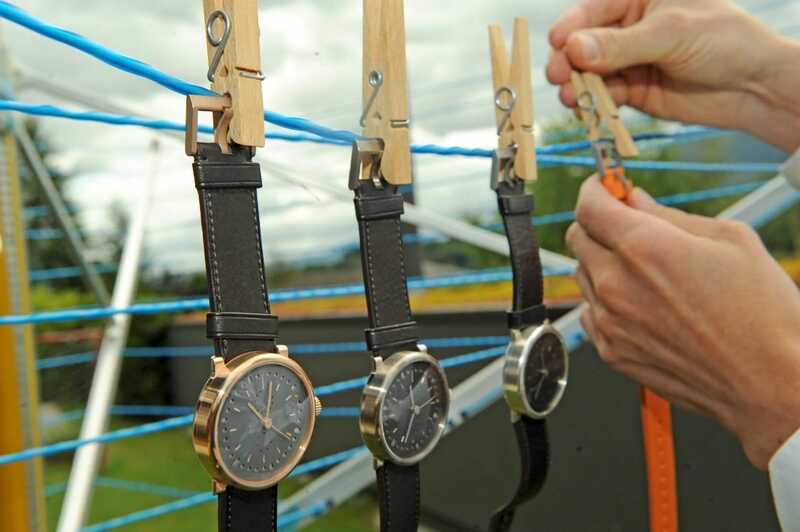 Bea had left the washing line up today while we were shooting the first ochs und junior anno cinquantas in red gold and white gold. Which is why they ended up there. We’ll be filling the ochs und junior website picture galleries with first-ever pictures of the white gold and red gold anno cinquantas. The first ochs und junior collection is now complete! We still need to sort out a couple of technical details in their mechanisms. We’re waiting to be supplied with a larger white gold bearing for the winding rotor, and Paul is working on a detail of the movement for the short production run. Meanwhile Ludwig Oechslin is fine-tuning his dials. He’s making them himself in his workshop. He machines then heats them and loves the little differences that emerge between his miniature works of art. Each is a one-off!